Our first makeover was a wonderful experience. 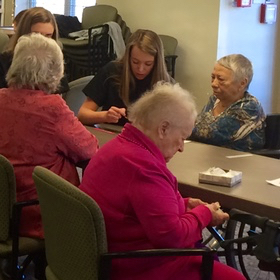 I enjoyed meeting the ladies in the nursing home as I got to know them through painting their nails and giving them makeovers. My favorite part of the makeover was realizing how thankful these women were for the time we were spending with them. I discovered that even though these women are older, they still want to be connected with younger generations and want to be a part of the community. Through this makeover, I think we were able to make them feel special. One of the residents stood up and thanked us for being there, and she said that of all the nice things that had been done for them at the nursing home, our act of service really stood out. It felt good to know that we made a difference in the lives of these residents.